How tired are you of that carpet beneath your feet? Perhaps you bought your home with every intention of replacing it as soon as possible, but it kept getting pushed to the bottom of the to-do list. Maybe you’re in the market for a new home, and you want to know which flooring type holds the most value. You need to analyze renovation costs before you take the plunge on your new home, and flooring can potentially be a huge investment. Regardless of your situation, we can all agree that a home’s flooring is integral to its character and mood. What would a craftsman-style bungalow be without knotty wooden floors? What would a Spanish Revival-style home be without some burnt orange tile flooring somewhere? Keep reading to compare three of the most popular flooring types to decide which is right for your home! There’s just something about hardwood flooring that makes people weak at the knees. Whether it’s brand new and shiny or old and a little beat up, it adds a certain timeless character to any home that other styles of flooring just can’t replicate. It’s also super tough, so it’s great for a family full of rough-housers. It comes in tons of different varieties to suit your home’s mood. The biggest downside is that hardwood flooring can be crazy expensive. It’s that gorgeous for a reason! It can also get scratched up pretty easily, which is frustrating for homeowners who’ve invested a lot into a renovation. Laminate is perfect for those who want the look of hardwood flooring, but don’t want that hefty price tag. It’s easy to clean and comes in a thousand different patterns and designs to suit any home. If you’re a pet person, laminate flooring is one of the best options for you. Unlike hardwood flooring, it won’t scratch up from sharp claws. Also unlike hardwood, it doesn’t have any cracks to speak of to gather pet hair and dander. If you’re a clean freak who wants endless possibilities, laminate is the way to go. Somewhere in between hardwood flooring and laminate flooring is tile flooring. It’s got that rich, natural quality that laminate doesn’t have without being as expensive as hardwood. It also comes in tons of different designs and patterns, from mod to antique to retro. Like laminate, you can also purchase tile that’s designed to look like hardwood. It’s easier to clean, immune to scratching, and holds a little more value than laminate. The downside? It’s a little tougher to install than laminate, often requiring a professional. It’s also cold on your feet! Tile floors often require a cozy rug in the living room, and some bath mats in the bathroom to keep your home feeling warm and comfortable. You’ve read up on the essential differences between tile flooring, hardwood flooring, and laminate flooring. Hopefully, you’ve got your renovation in mind and have come away with some new ideas about what you need for your space. If you’re doing some home remodeling in Tacoma, get in touch with us. 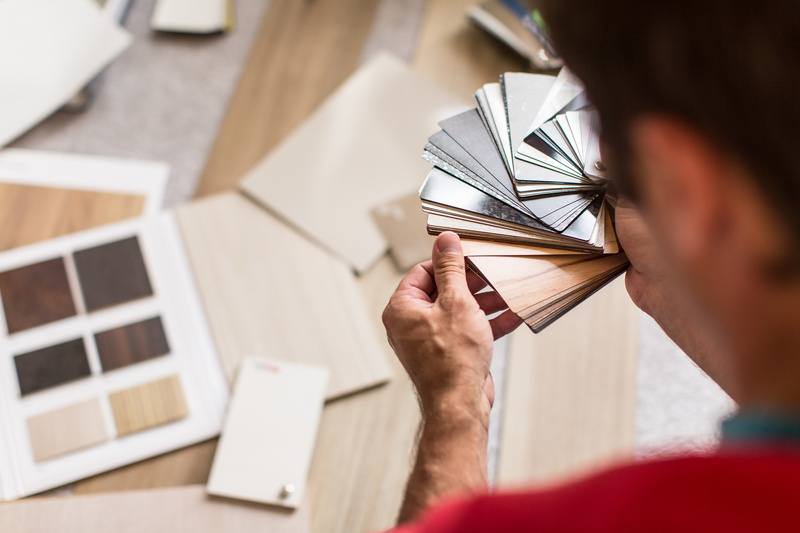 We’d love to talk shop and help you decide which flooring is right for you!